Boston shines as an Irish Catholic. Lubbock boosts being Baptist. New York is a jovial Jew. Detroit has it’s Islamic influence. Hollywood loves Kabblah. If cities could be religiously personified, what about the emerald city we call Portland Oregon? I feel like being a pagan for me is highly represented by the spirit of the city of Portland, or Portlandia as we sometimes refer to her as. People living here understand and honor the true meaning of being children of the earth; So why is Portland so pagan? The planet is important to us pagans and in Portland, we recycle like there ain’t no tomorrow—literally! Composting and all. Business too! Creative reprocessing of items, such as reusing take-out hinged containers for work lunches, or reusing glass jars for drinking mugs—that saves the planets resources in two ways! I save napkins and plastic wear that I must use, and reuse at home. Or save used gift cards and rework as luggage tags! What weird creative things do you do? Please share! Community is a fundamental pagan value. As a practice of ancient times, community was all we had. We relied on the integral support of a larger community for the micro and macro health of everyone involved. The city of roses has a large significance to building community on so many levels such as events that are city-wide, neighborhood-wide, block-wide, apartment building-wide and friends-wide. Community volunteerism or even volunteering with friends to trade services or to help move apartments is popular. People will help other people out here, supporting causes, supporting each other or even marching together on PSU campus to demonstrate against a recent Bush administration policy! Protecting the earth even through industrialization with alternative thinking concerning energy needs; wind turbines on housing units and large buildings, people building rainwater collectors for water use, solar panels used on homes and for car parking meters. I’ve heard of a few people, and have even seen someone who has removed their drive-way to their home to put in a garden, now that’s totes rad! A collective spiritual mind: Many, many people I have encountered since 2006 seem to have a collective respect for spiritual modalities that are occult-like; tarot, astrology, observing and celebrating the season changes, observing pagan sabbats (minus the label), mind, body and spirit focuses with yoga, whole foods and drum circles! Moon cycle observations are not uncommon either. Lunar seed cycling anyone? FOOD! Portland is such a foodie town, no doubt. But why is Portland’s attitude to food a pagan quality? Because as children of the earth, we should respect our bodies and love them, giving our temples what they need to function properly. This basic human pleasure is a gift from the Father or Sun and our Mother or Earth. 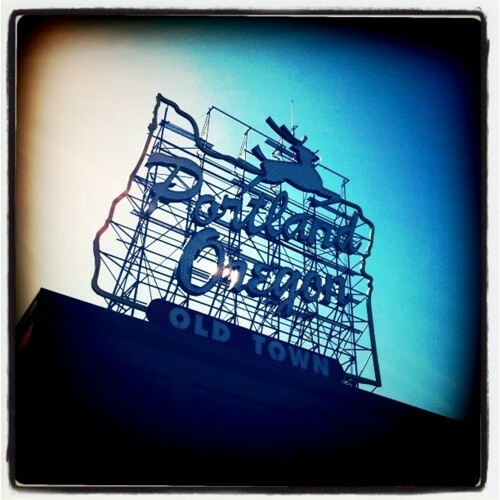 Portland is HUGE on organic, hormone free foods from cheese, milk, meat, veggies and grains! Many restaurants, food cart vendors and grocery stores are aware of this trend. Also, vegan, organic and raw restaurants are plentiful and popular! Awareness of how our bodies respond to food is also evident in the rise of gluten-sensitive, milk-sensitive and soy-sensitive people in Portland and many people and food establishments are peachy keen to this issue. Respect for our bodies and the energies we consume are a focus with many residents. I could go for some raw live pizza from Blossoming Lotus in Irvington or up on Alberta for a gluten-free, vegan grilled cheese from Grilled Cheese Grill! Local purchases help to strengthen the local web. We are all connected and this is a cornerstone pagan belief as it pertains to the web of life. Purchasing locally from a farmers market or for clothing, or goods, or services is a strong Portland value. ‘Keep Portland Weird’ is popular tag-line as evident by bumper stickers that adorn cars, bikes, bike racks, traveler mugs, guitar cases and abandon buildings, is actually a local business initiative. I believe the local government has also put forth ordinances restricting how many “chain” business’ are inside the city! Where the hell can I buy a Chinese manufactured quesadilla maker at my local 24-hour WalMart?! Next time you take a walk in the city, look around. Next time you talk to your neighbor, listen closely. Next time you take a local bit, savor gently. Next time you think about our city, consider it as a living, breathing entity and what does the energy of this city say to you? A Pagan in Portland wants you to know that our city rides a broom stick, ya’ll! Older PostRepitious Message, What's a Shaman?